When you typically think of graduates doing outstanding work after graduation, one may argue that it’s coming from a young and ambitious 20 or 30-something career driven Reynolds School grad. With that said, please get to know Doris (Hanssen) Sinofsky. 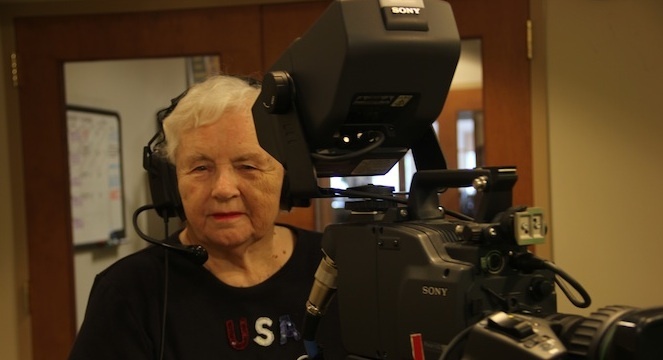 She’s a graduate from the class of 1949, and at the age of 86, she’s managed to produce an award-winning documentary on the Holocaust titled, “Never Forgotten.” The film won a 2013 Telly Award. It is the premier award honoring the finest film and video productions, groundbreaking web commercials, videos and films, and outstanding local, regional, and cable TV commercials and programs. Doris Sinofsky – Never Forgotten from Reynolds School of Journalism on Vimeo. The idea to produce “Never Forgotten” came to her after she met a fellow resident at Cedar Crest, an active community for senior adults in northern New Jersey. After speaking with Lily, Sinofsky soon discovered that several of her fellow community members had not only suffered through and endured the Holocaust but managed to survive, recover, move on, relocate to the United States, start families and live meaningful lives. A total of 19 interviews were conducted for the documentary. Sinofsky worked with Bert Moore, Cedar Crest’s pastoral ministries manager and former Navy chaplain, to conduct interviews. Other interviews were humorous and unexpected. “Never Forgotten” debuted at the Cedar Crest theater on May 21 at 7 p.m. to a packed house of more than 263 people. “I received a great education at the Reynolds School,” she said. “I still write for the Cedar Crest newspaper. I conduct interviews and keep all of my notes for one year. I worry about what my lead is going to be so I can entice people to read more. During her time at the Reynolds School, Sinofsky worked for the Sparks Tribune for three years and interned during her senior year with the Reno Gazette-Journal. In addition to working for the Sparks Tribune and interning for the Gazette, Sinofsky served as secretary to the Nevada student body president and worked for the Nevada Sagebrush. She also served as editor of Artemisia, the University of Nevada’s yearbook, and was president of the Press Club. Her time at Nevada also led her to her husband, Ken Sinofsky, a Nevada football (1944-1949) star. He was inducted into the Nevada Athletics Hall of Fame in 1987 and is a member of the Nevada Century Team.